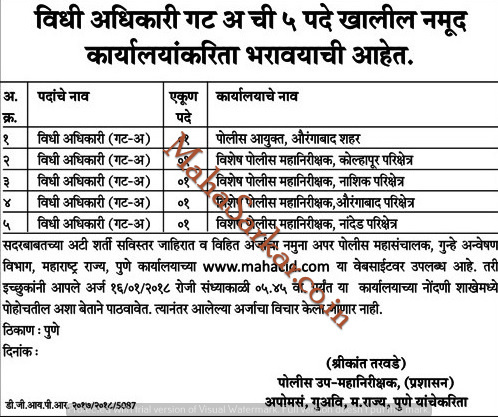 MAHA CID (Criminal Investigation Department Pune), Published Job Notification for 01 Law Advisor Posts. Candidates who wish to apply must look at MAHA CID Law Advisor Recruitment 2018. Eligible candidates can apply Offline before 19-04-2018. Interested & Eligible candidates can send their application along with all the necessary documents and testimonials to अप्पर पोलीस महासंचालक, राज्यगुन्हे अन्वेषण विभाग, महाराष्ट्र राज्य पुणे विद्यापीठ चौक, पाषाण रोड, मॉडर्न लॉ कॉलेज शेजारी, चव्हाण नगर पुणे 411008. Starting Date, Last Date to Apply Offline at Criminal Investigation Department Pune which candidates should be remembers as follows. Start Date to Apply Offline: 05-04-2018. Last Date to Apply Offline: 19-04-2018. 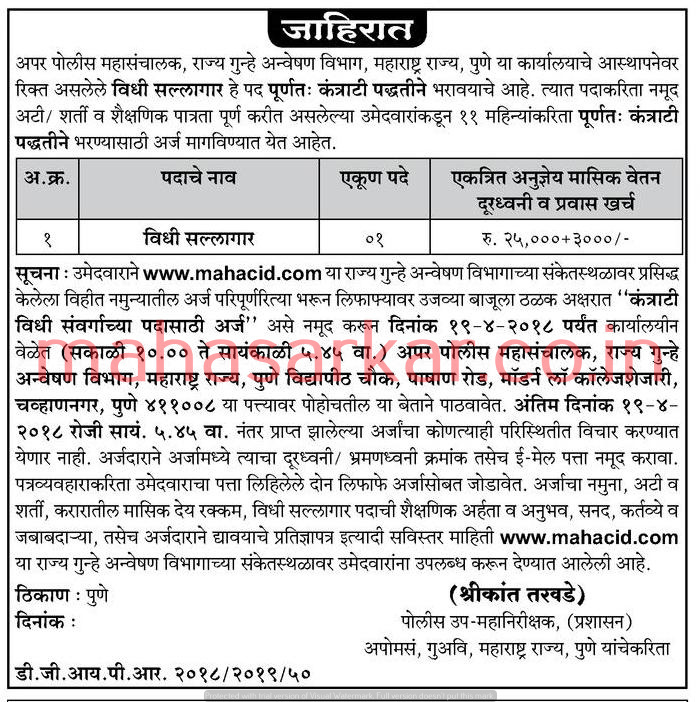 MAHA CID (Maharashtra Criminal Investigation Department), Maharashtra Published Job Notification for 05 Law Officer Posts. Candidates who wish to apply must look at MAHA CID Recruitment 2018. Eligible candidates can apply offline before 16-01-2018. Education Qualification: Bachelor Degree in Law and More. For Post wise Education Details follow the detailed advertisement. Age Limit: Age limit should not exceed the 62 years. Interested & Eligible candidates can send their application along with all the necessary documents and testimonials to Criminal Investigation Department, Maharashtra State, Near Modern Law College, Pune University Chowk, Chavannagar, Pashan Road, Pune – 411 008. Starting Date, Last Date to Apply offline at Maharashtra Criminal Investigation Department which candidates should be remember as follows. Last Date to Apply offline: 25-01-2018.